Police are appealing for help to identify the driver who knocked a cyclist off his bike and drove off. The accident occurred on Hurdsfield Road in Macclesfield near the junction with Steeple Street last Wednesday night (9th April). It’s thought the vehicle was a 4×4, possibly a green old-style Land Rover, was pulling a caravan at the time of the collision. The cyclist, a 35 year old man, was taken by ambulance to Salford Royal Hospital with facial injuries and a suspected broken jaw, was found to have have soft tissue damage. Police are urging anyone with information about the driver to get in touch by calling 101. Now that the weather is improving and more cyclists are taking to the road we must all remain vigilant and considerate. 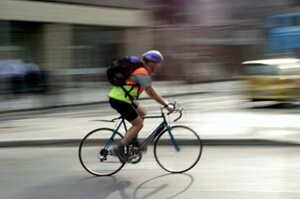 An extra few moments to give a cyclist time and space or to cycle more carefully makes an enormous difference and significantly reduces the risk of an accident. This article was added on Tuesday, April 14th, 2015 at 12:32 pm and is categorised under Cheshire News, General News, Macclesfield News, Traffic Accidents. Both comments and pings are currently closed. Error: Error validating access token: Session has expired on Saturday, 09-Mar-19 13:12:58 PST. The current time is Thursday, 25-Apr-19 21:48:55 PDT.